Two cherished classics from this world-class company. 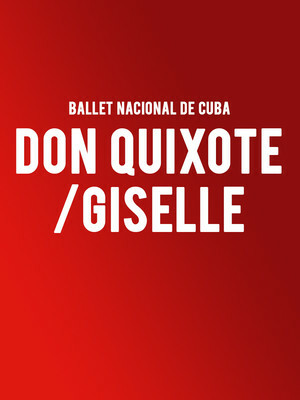 Why See Ballet Nacional De Cuba - Don Quixote / Giselle? Returning to the Kennedy Center for the first time since 2011, Ballet Nacional De Cuba bring two of their fantastic signature works for a short season this summer, once more displaying their wonderful approach to romantic ballet as infused with the flavor and tradition of their home country. Choreographed by Artistic Director and founder Alicia Alonso after Marcus Petipa, this famed interpretation of the classic tale is the definitive entry to the company, full of flourish and a divine tribute to Spanish dance. Also by Alonso after Jean Coralli and Jules Perrot, the company display their impeccable talent in this integral, unmissable work. Seen Ballet Nacional De Cuba - Don Quixote / Giselle? Loved it? Hated it? Sound good to you? Share this page on social media and let your friends know about Ballet Nacional De Cuba - Don Quixote / Giselle at Kennedy Center Opera House. Please note: The term Kennedy Center Opera House and/or Ballet Nacional De Cuba - Don Quixote / Giselle as well as all associated graphics, logos, and/or other trademarks, tradenames or copyrights are the property of the Kennedy Center Opera House and/or Ballet Nacional De Cuba - Don Quixote / Giselle and are used herein for factual descriptive purposes only. We are in no way associated with or authorized by the Kennedy Center Opera House and/or Ballet Nacional De Cuba - Don Quixote / Giselle and neither that entity nor any of its affiliates have licensed or endorsed us to sell tickets, goods and or services in conjunction with their events.